Alli is smiling big. I wonder why. 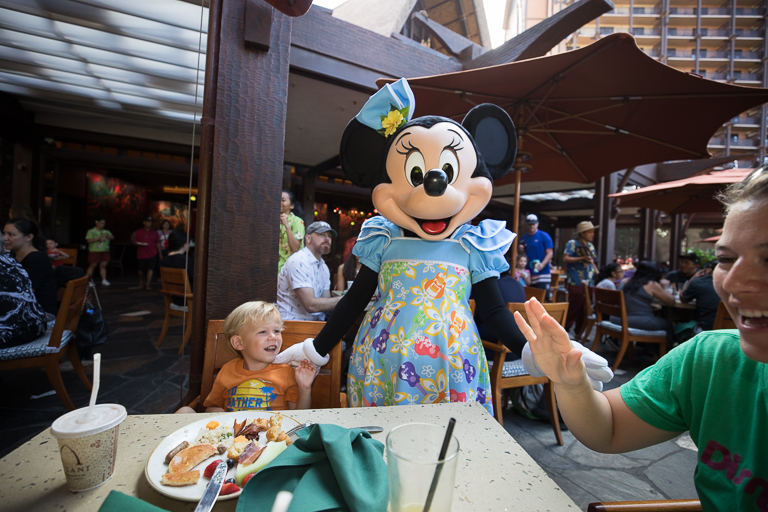 We're having breakfast with Mickey Mouse at Makahiki! 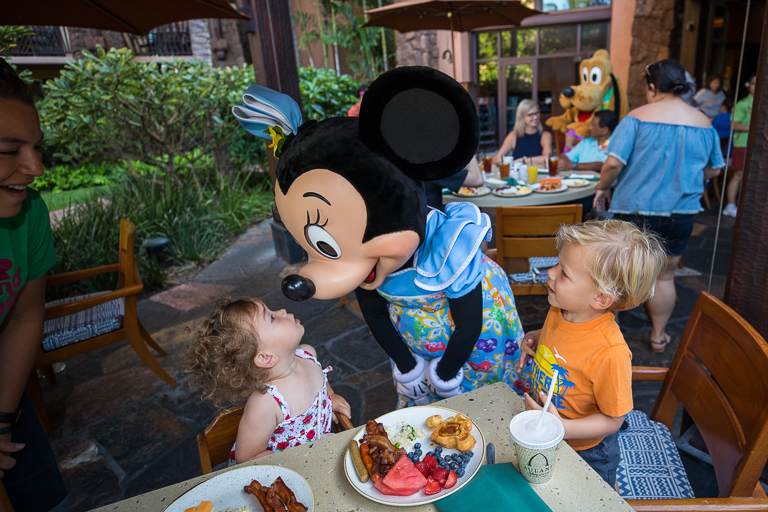 We checked in to our 7:45am breakfast reservations and waited in a short line to see Mickey. 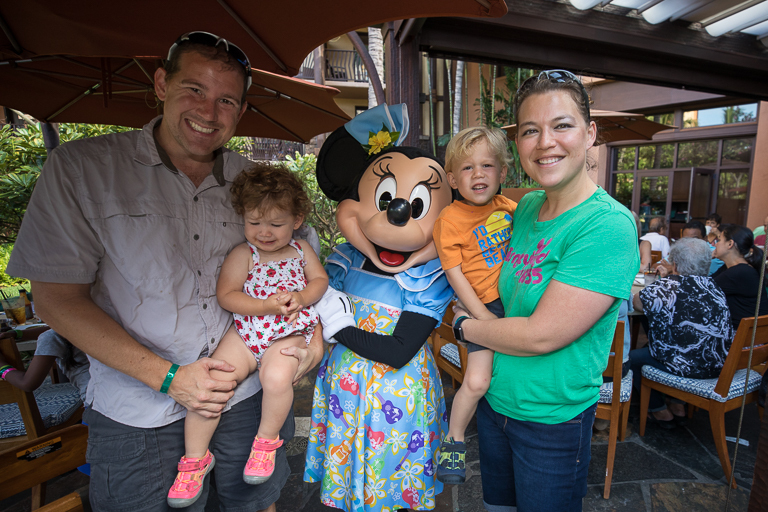 We were just at Disneyland a couple weeks ago. 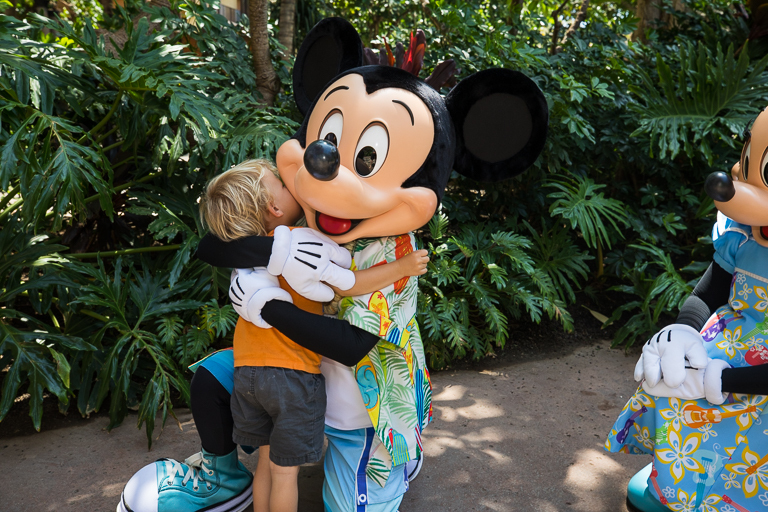 Mickey must be on vacation in Hawaii too! 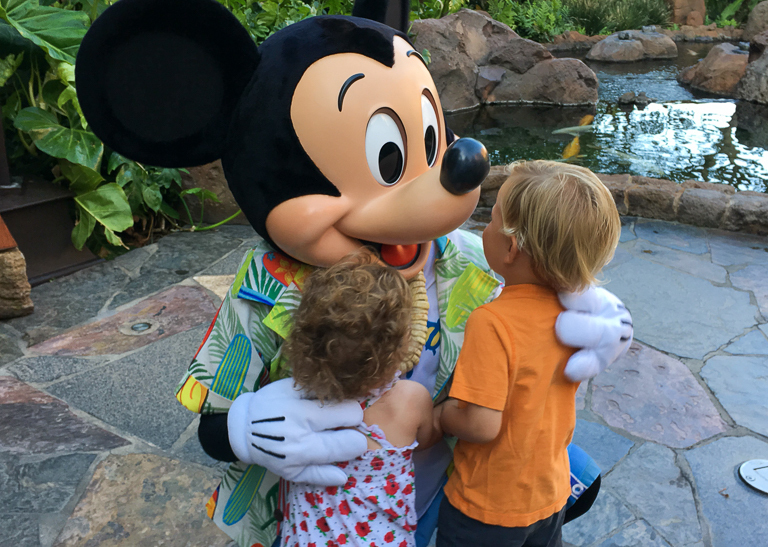 Mickey could only see Alli at first. 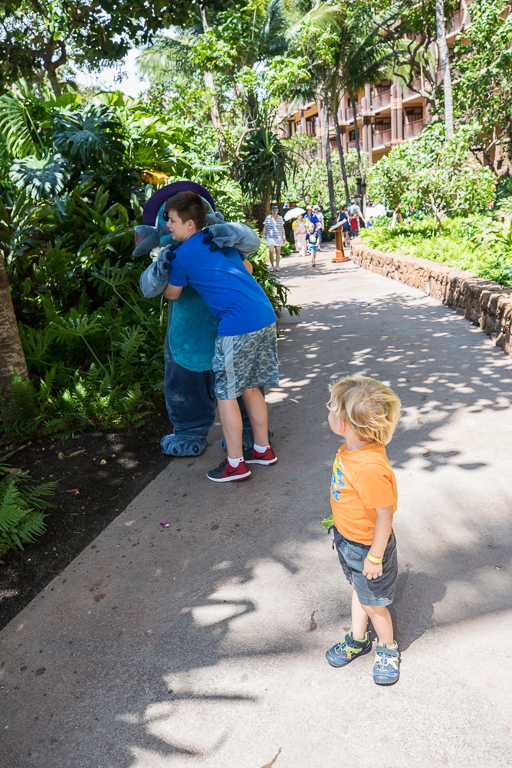 Then he was surprised to see another little one waiting to give him big hugs. 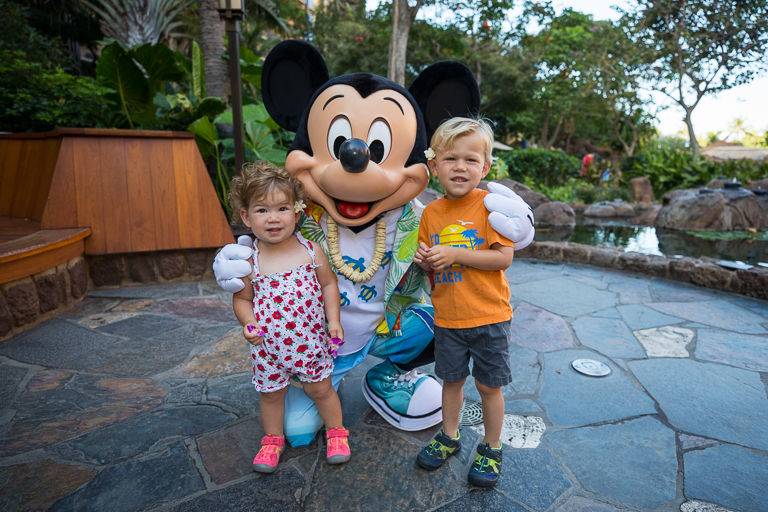 The kids loved seeing Mickey here on our Hawaiian vacation. 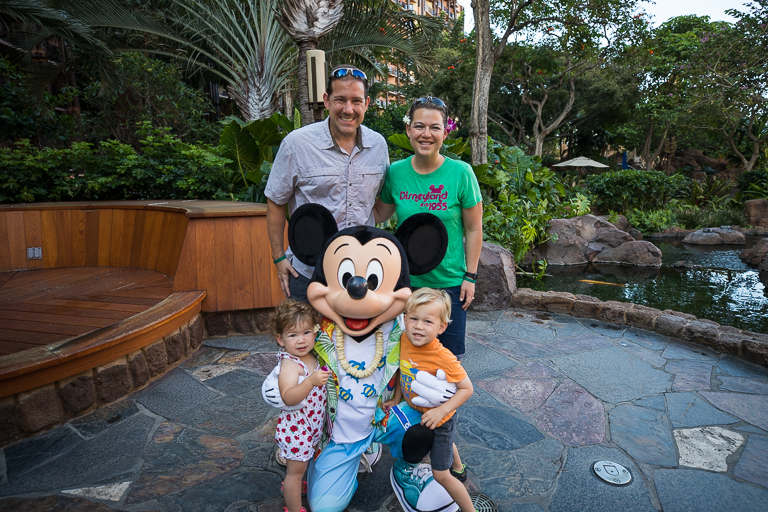 Of course we've got to get a family picture with the main mouse. 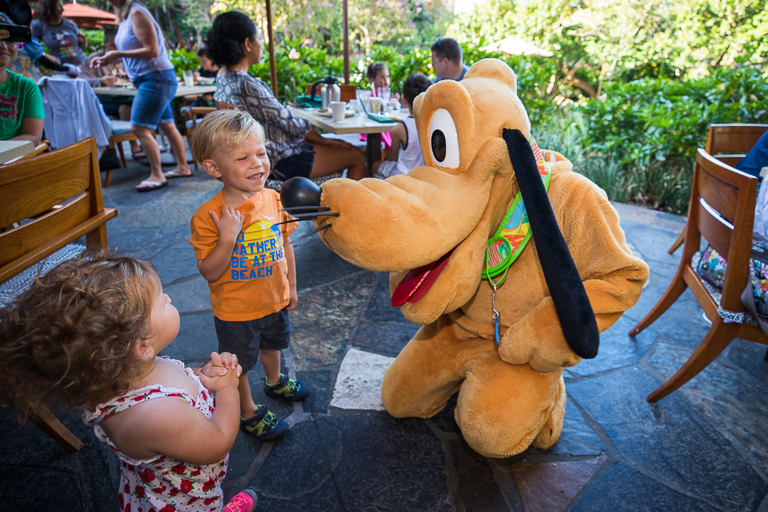 After meeting Mickey we were quickly led to our table and Pluto just happened to be waiting for us. 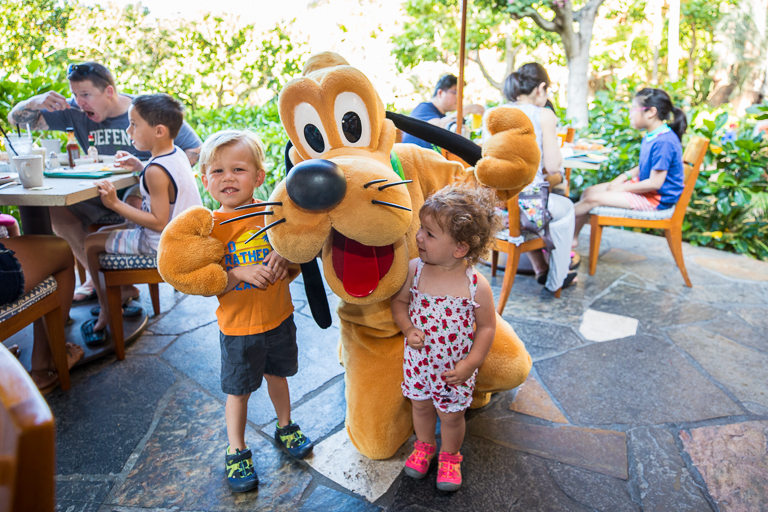 Ian - Pluto must be on vacation too! 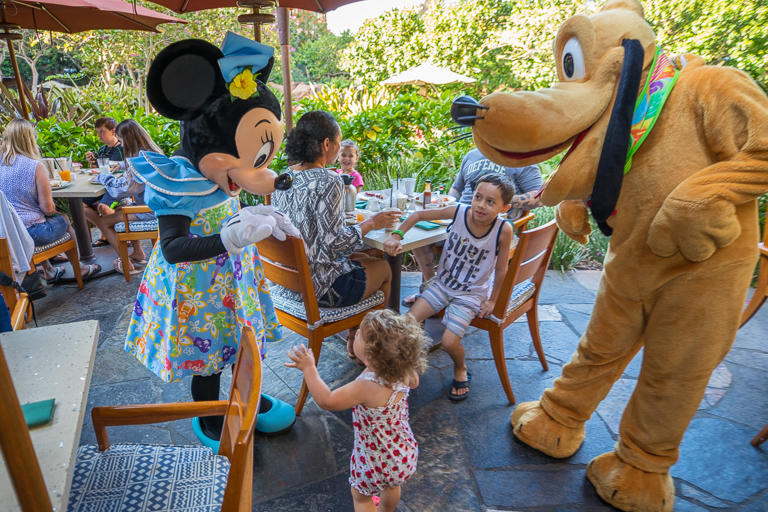 And while we were visiting with Pluto, Minnie happened by. 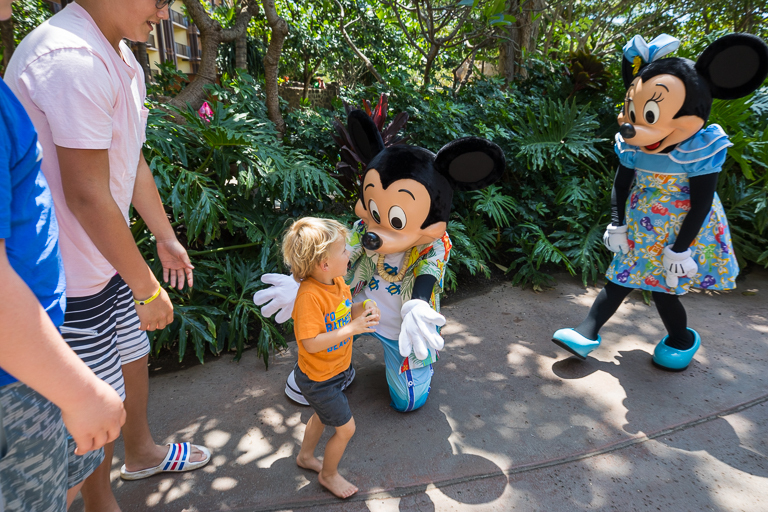 There's only 3 characters here (well 2 if you consider Mickey is only at the entrance), but it felt like we saw them quite a bit. I thought the breakfast was fantastic and also a pretty good value for the price. 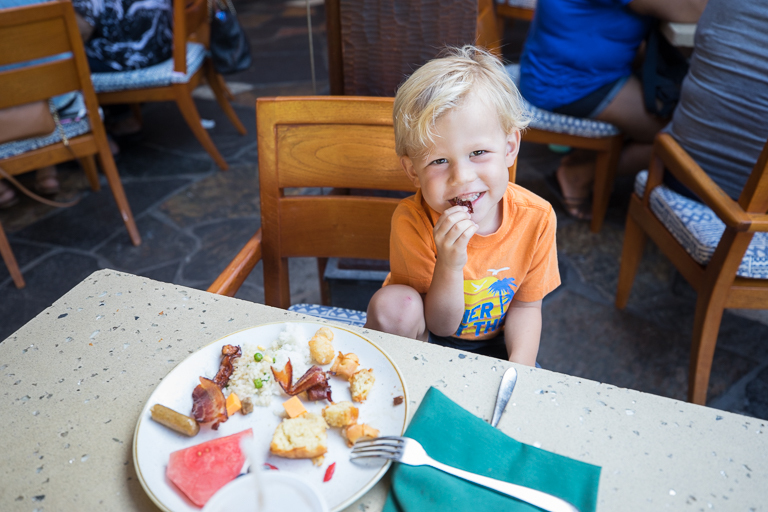 For the all-you-can-eat buffet, plus the interaction with all the characters it cost $37 per adult and $18 for Ian. Alli being an infant was free. 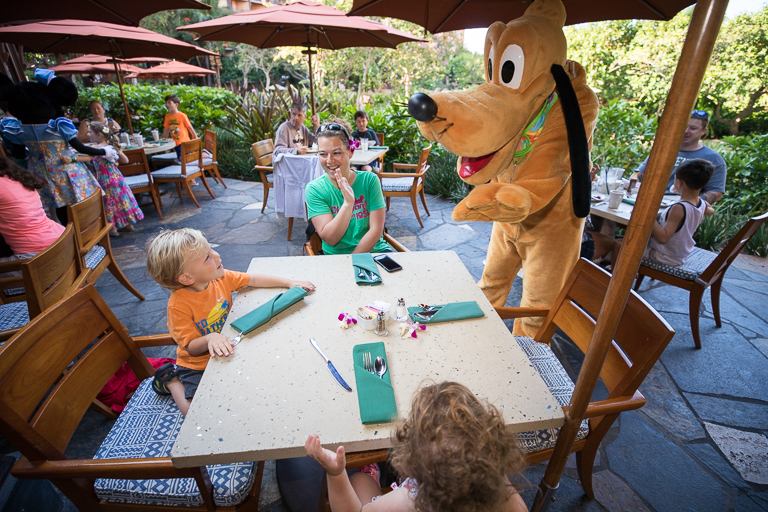 The kids ate pretty good with the large selection, but they were constantly on the lookout for characters. I thought there was a great selection with plenty of foods to choose from. 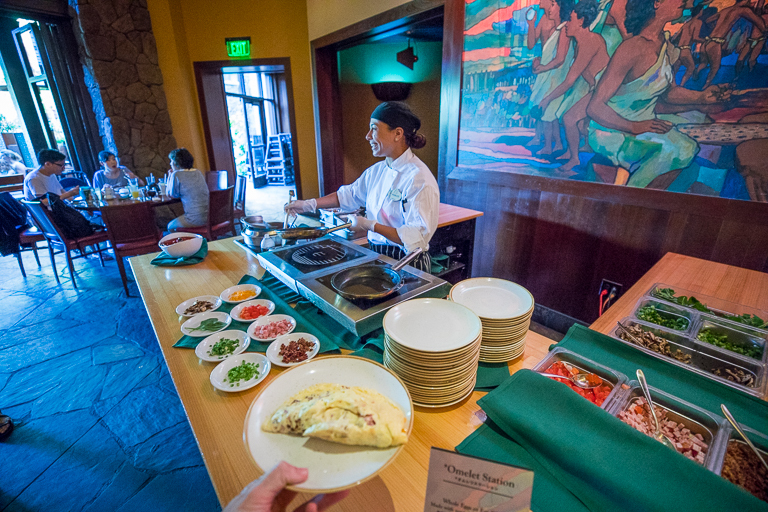 The Omelet station is always great. Lots of meat and cheese please. 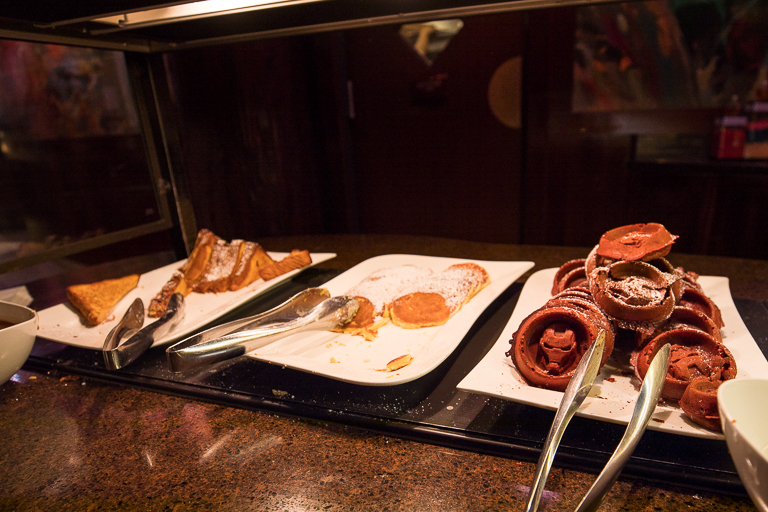 There were even Iron Man red velvet waffles. One of many plates. 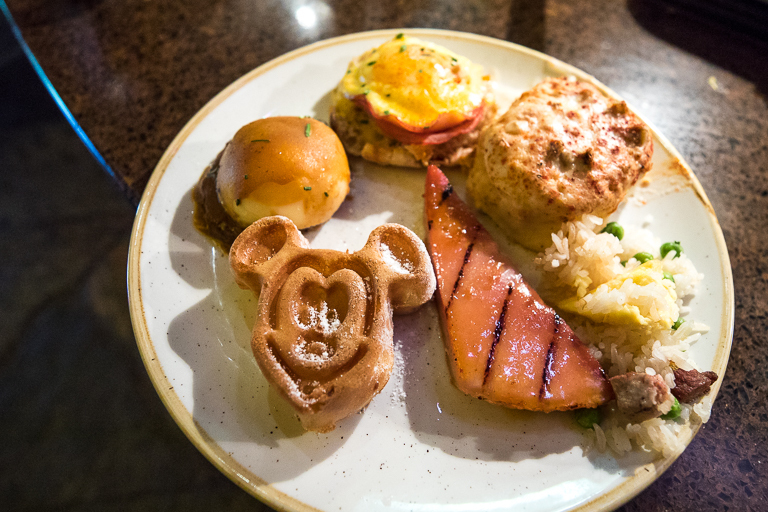 The Mickey waffle is classic of course. 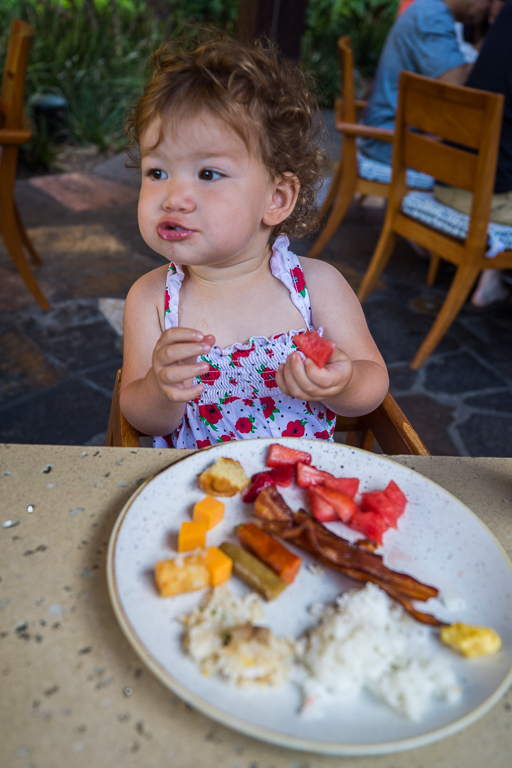 After all the hot foods, the fruits and cereals were next. 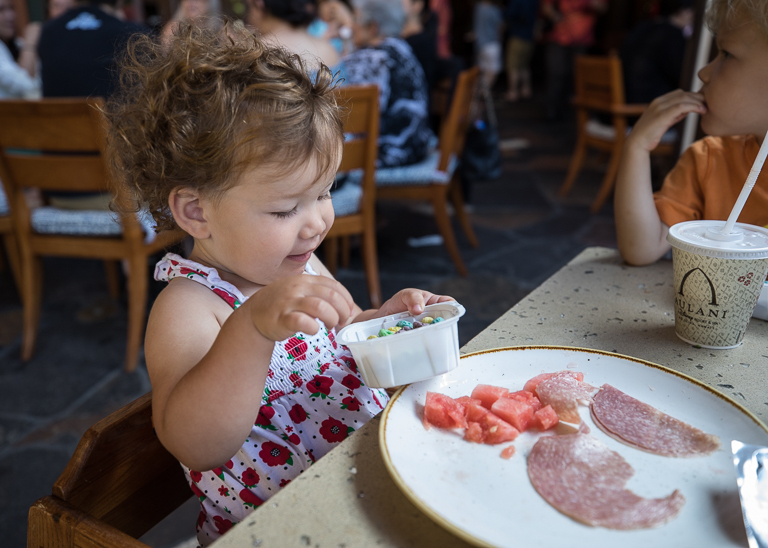 Being all-you-can-eat, we made sure to not leave hungry. 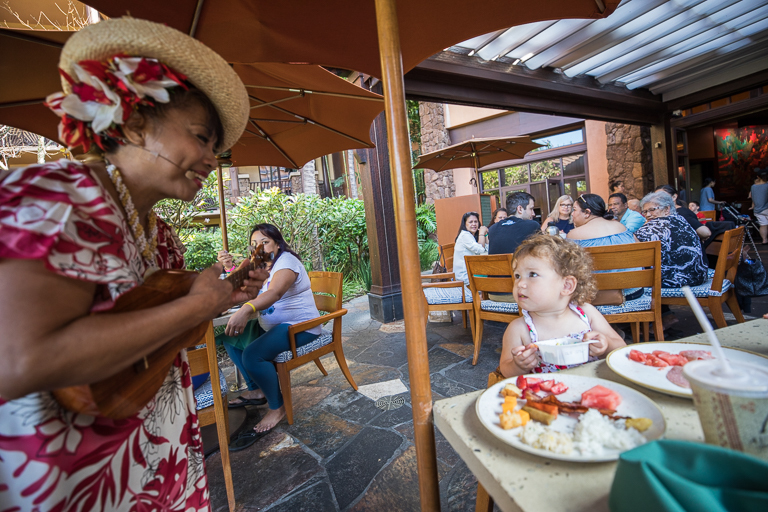 "Auntie" came around, playing her ukulele and teaching the kids some hawaiian words, like Ono (yummy) and Opu (belly). Phew. We're full. I think I can skip lunch today. 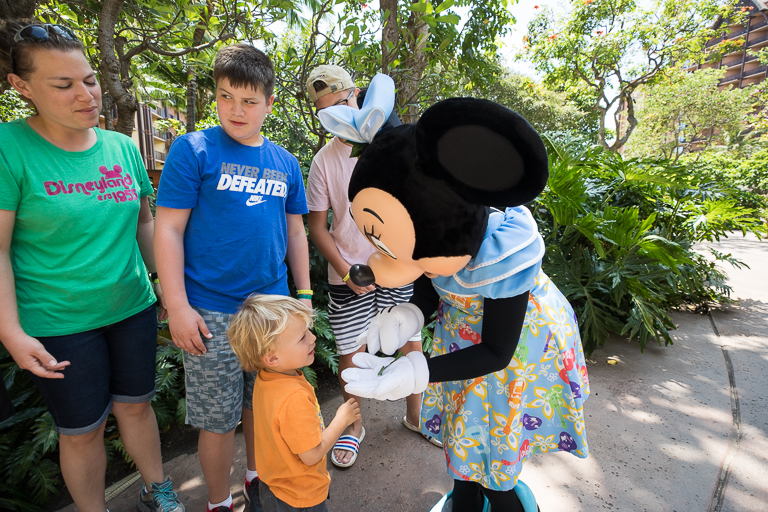 Bye Minnie! 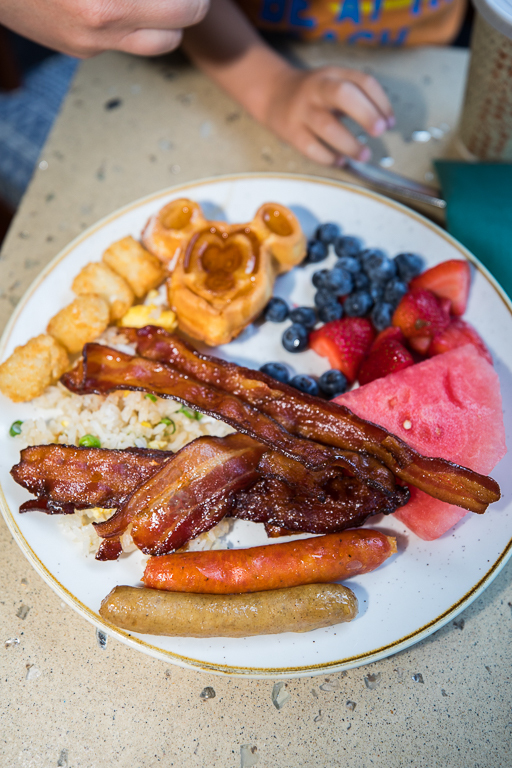 Thanks for breakfast! After breakfast it was straight up to the room to change into swimsuits. 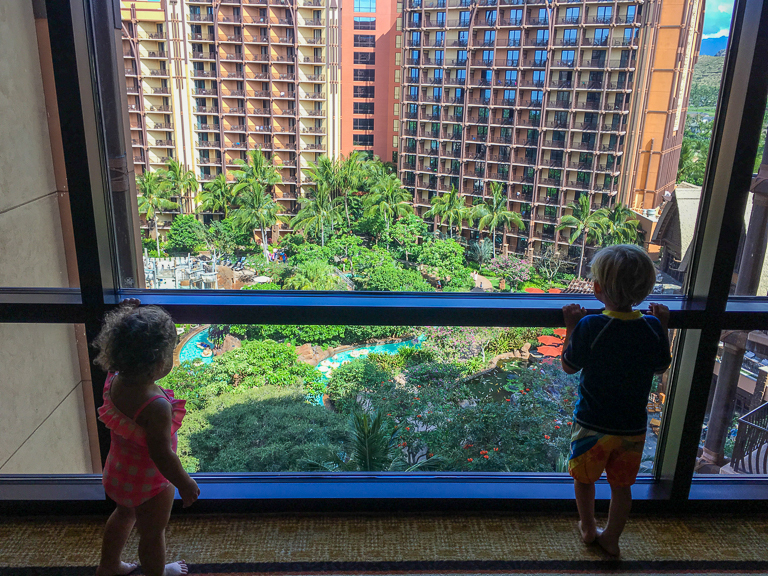 The kids are ready to get into the pools! 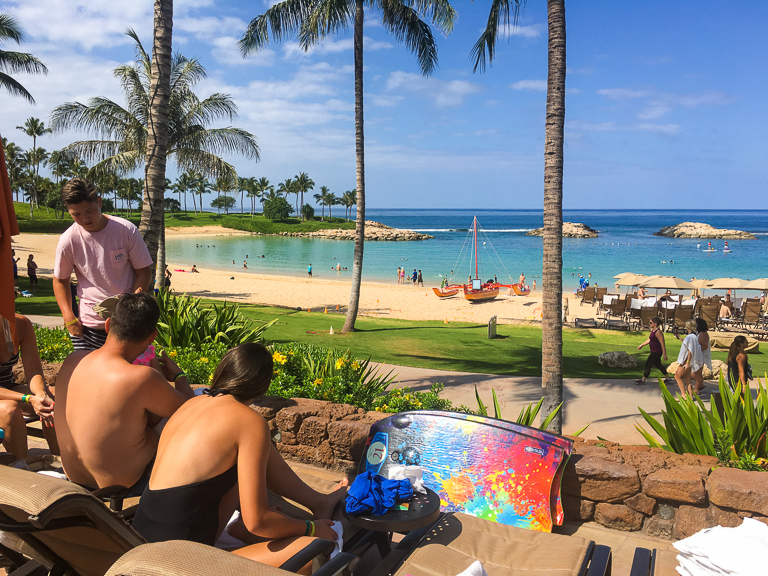 While we were at breakfast, the rest of the family was grabbing chairs overlooking the water to spend the day in. Beautiful. 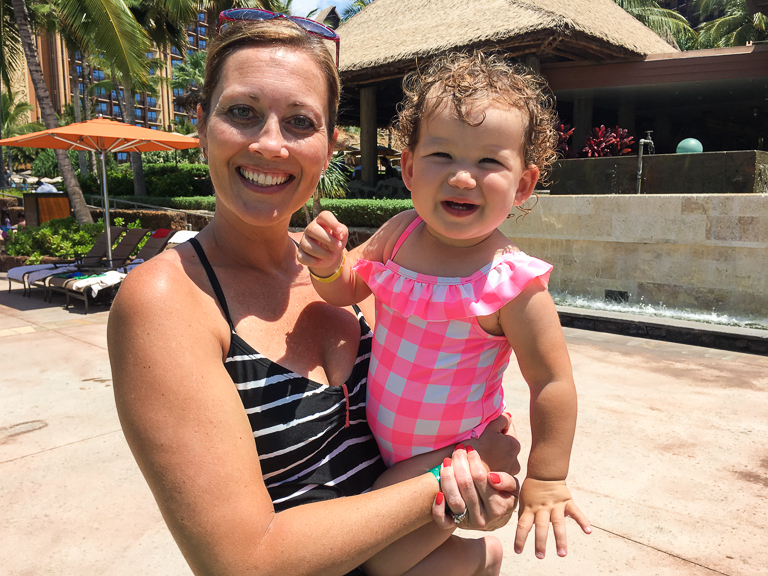 Theresa and Alli headed off to the lazy river. 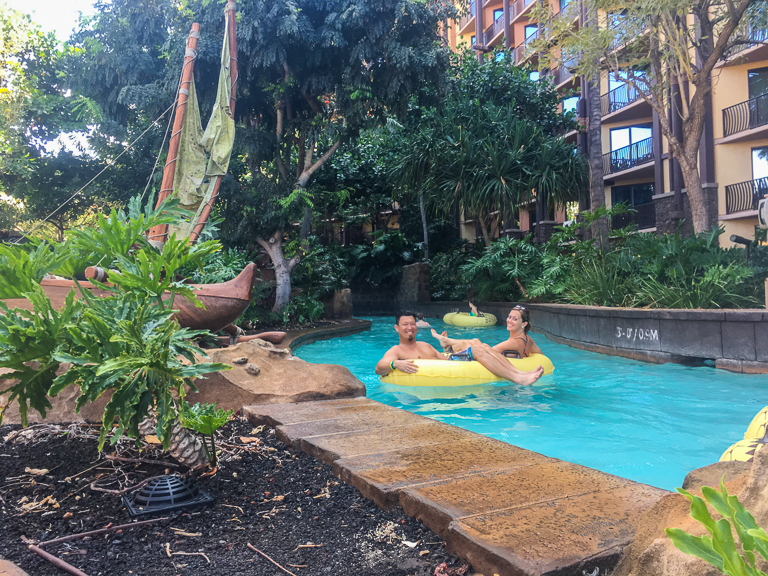 You could spend a whole morning floating around and around the lazy river in Waikolohe Valley. 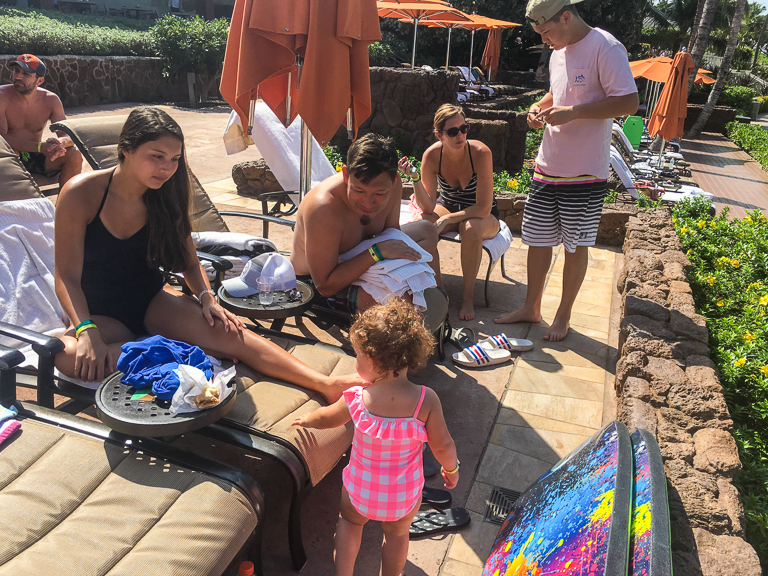 After leaving Alli and Theresa, I headed over to the water slides. There's two here and I'm wanting to try both. The first is the Volcanic Vertical slide. 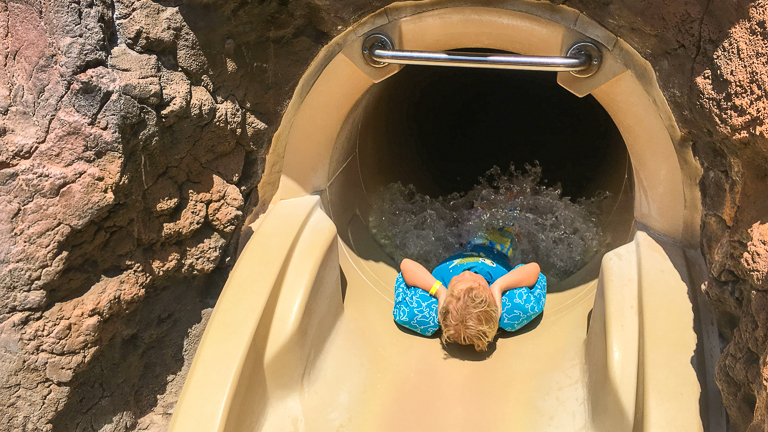 It's a fully enclosed slide and it actually surprised me. It was pretty fast and it was very very dark. I couldn't tell when any turns were coming up so it was a lot of fun. 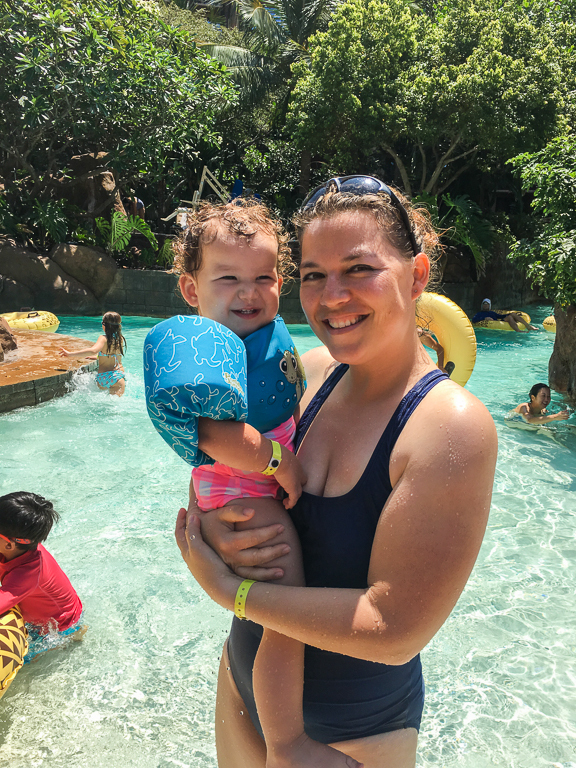 There's Don and Amy enjoying the lazy river. Now where is Ian? I know he went off with Pop Pop earlier but I haven't seen them in a while. Wow! I knew he was a little thrill seeker but this one surprised even me. 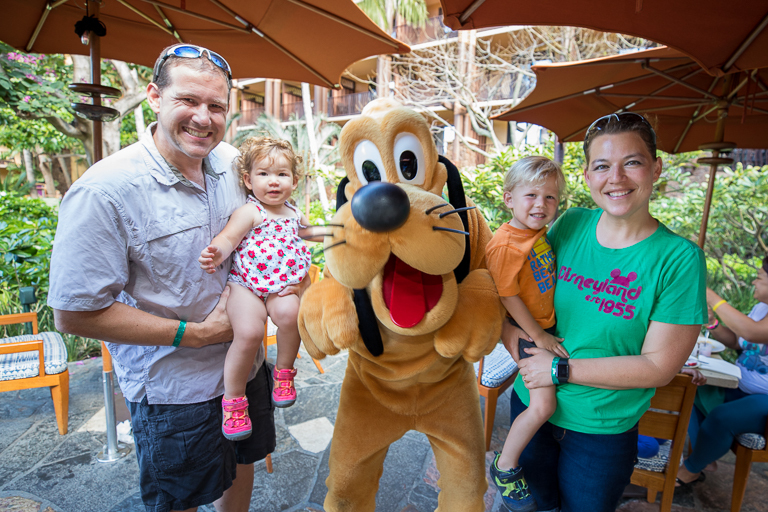 He's only 3.5 years old, and he's certainly the shortest person in line. But boy did he love it. He was all about following the rules too. Making sure that light was green before saying it was okay to go down. And somehow he must have misheard us when we told him the name. Volcanic Vertical was translated by Ian into Volcano Iceberg. 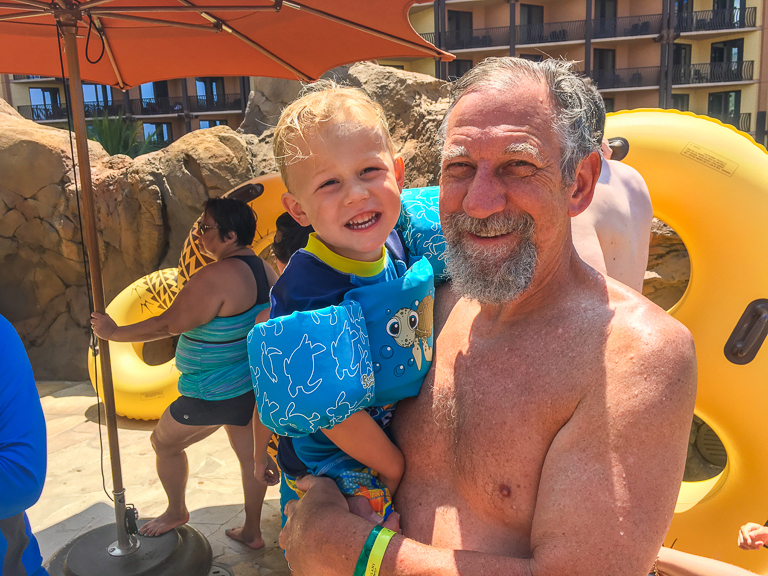 Ian and Pop Pop spent the whole morning going up and down the slide and in and out of the hot tub nearby. Must be a little loud because he covers his ears the whole way down. The day is meant to chill and relax. 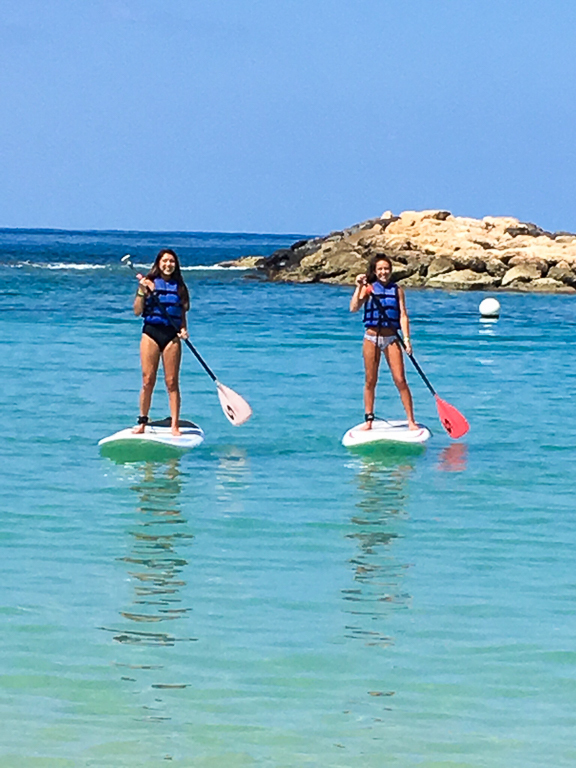 The girls enjoyed the lagoon and rented paddle boards. Time for a nap Alli. Luckily we've got some family who are willing to go hang out in the room while she sleeps. 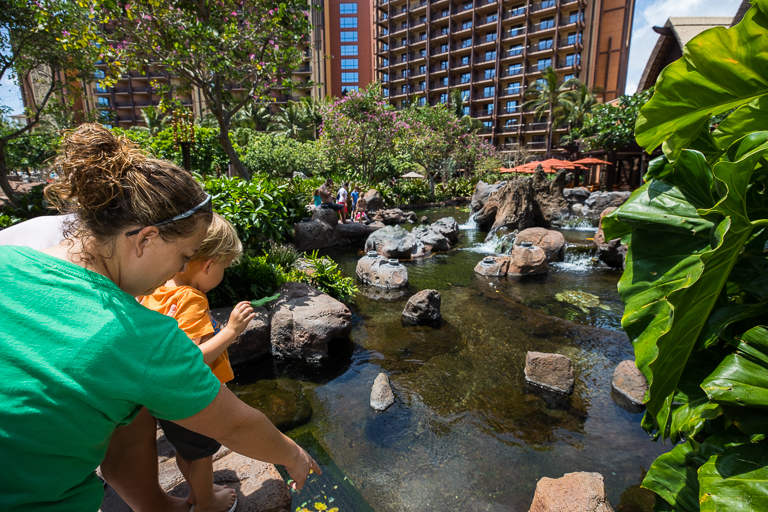 The Aulani resort have so much to offer. It's really too bad that we're only here for a couple days. We're rushing to see everything. 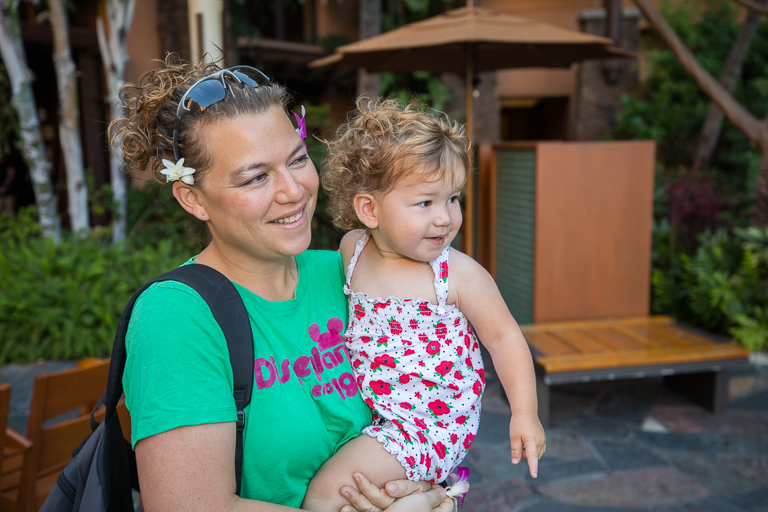 One of the things I new I wanted to do while we were here was go search for the Menehune. 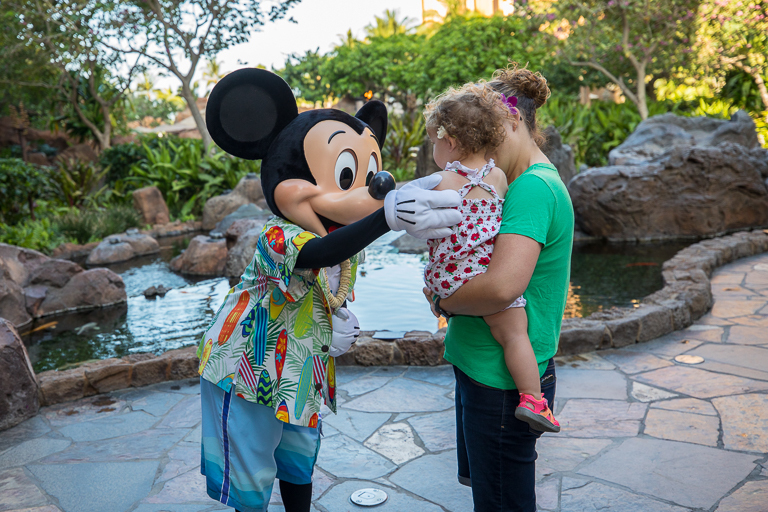 According to Hawaiian tradition, Menehune are mythological dwarf people who are known as superb craftspeople. There's even tales of them being a little magical. 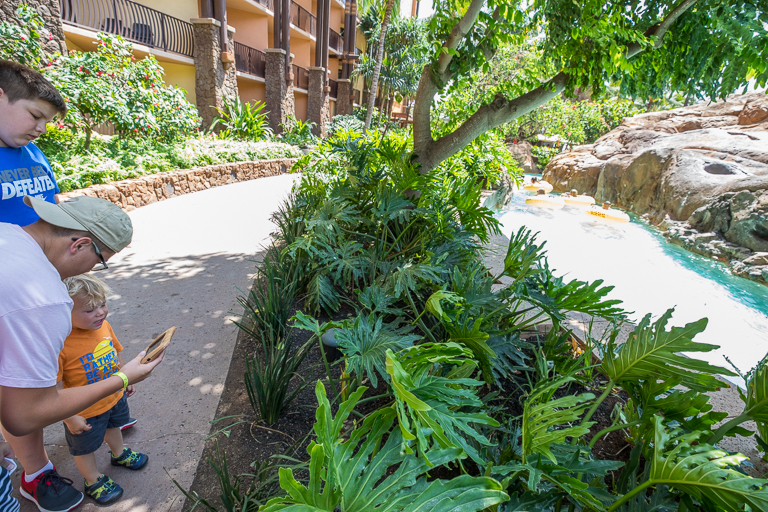 You can find them hiding out all over Aulani. Let's go see if the tales are true. 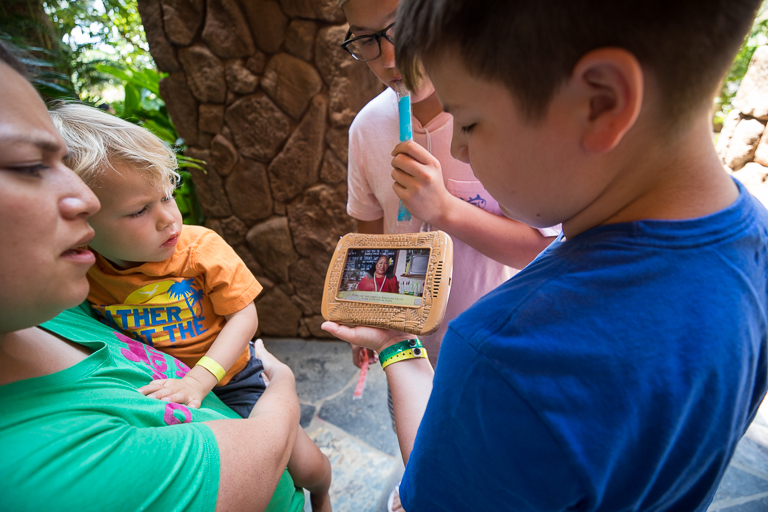 The Pau Hana community center was our first stop to grab a tablet. 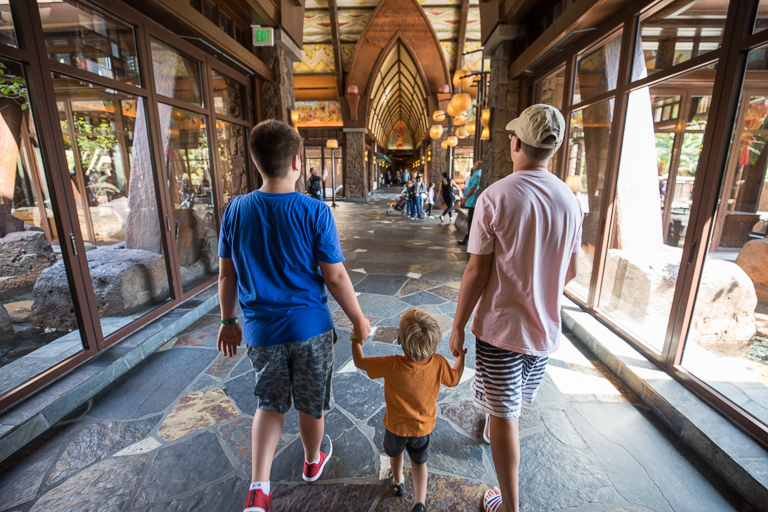 We'll use it to call Auntie who will be leading our adventure. 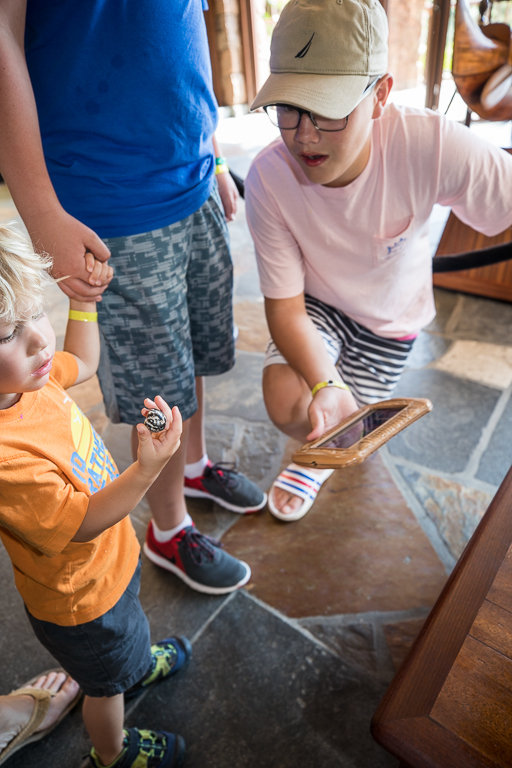 Our very first bit of magic happened as soon as we left the community center. 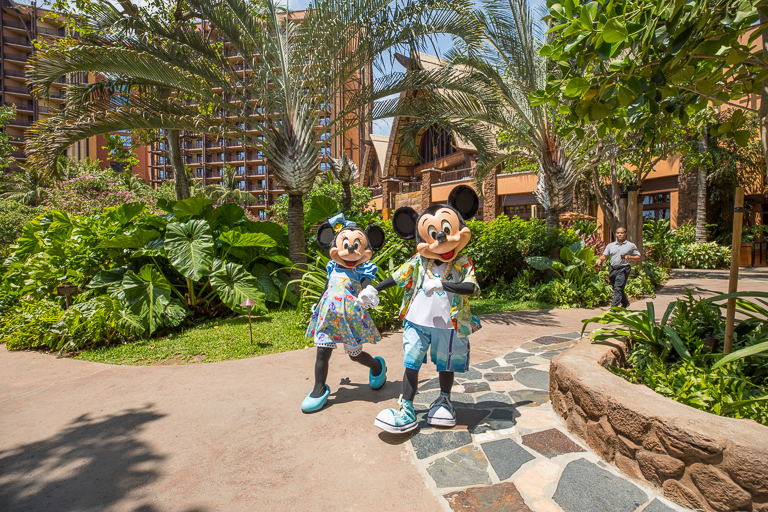 Here's Mickey and Minnie! 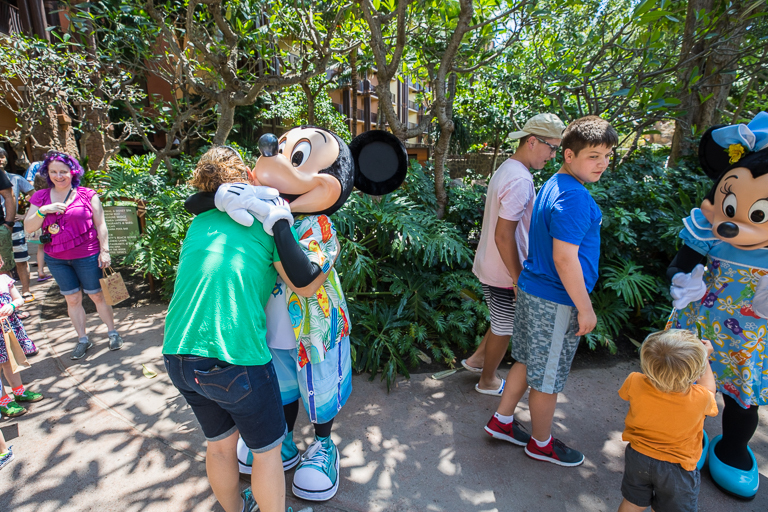 We just happened to catch them right as they were coming outside, so we got lots of time to give hugs and hang out with them. 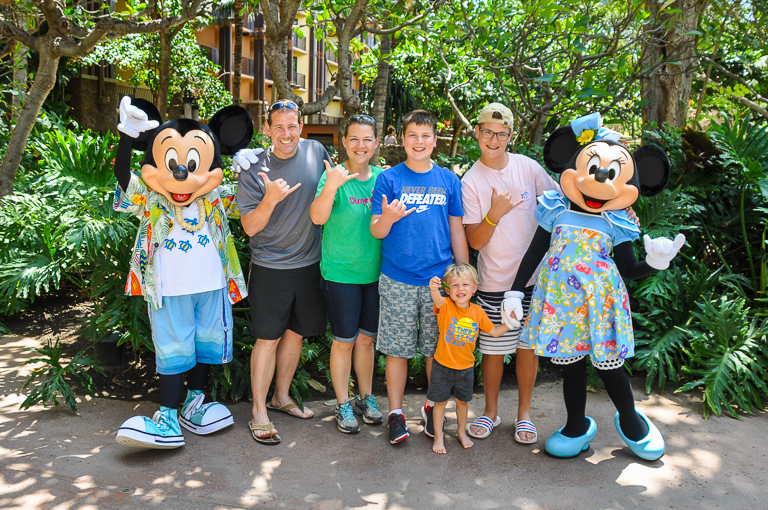 Hang loose everyone. Ian is showing off a leaf he found. 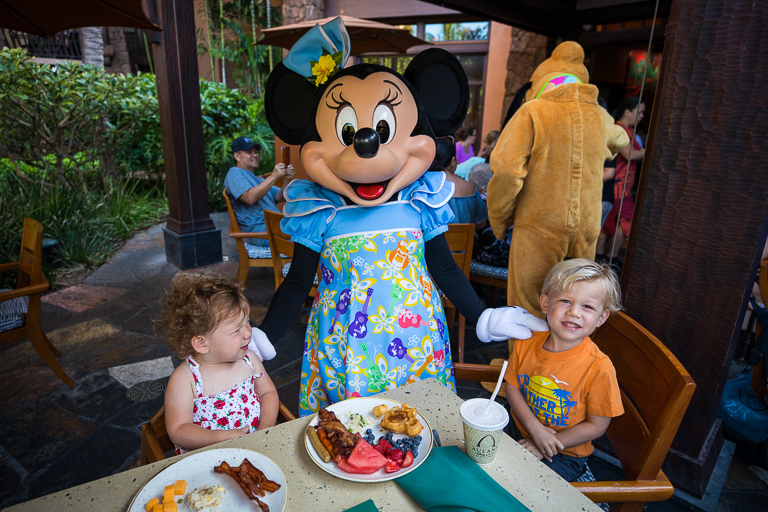 And offering it to Minnie. There's so many cool things here that are interactive. 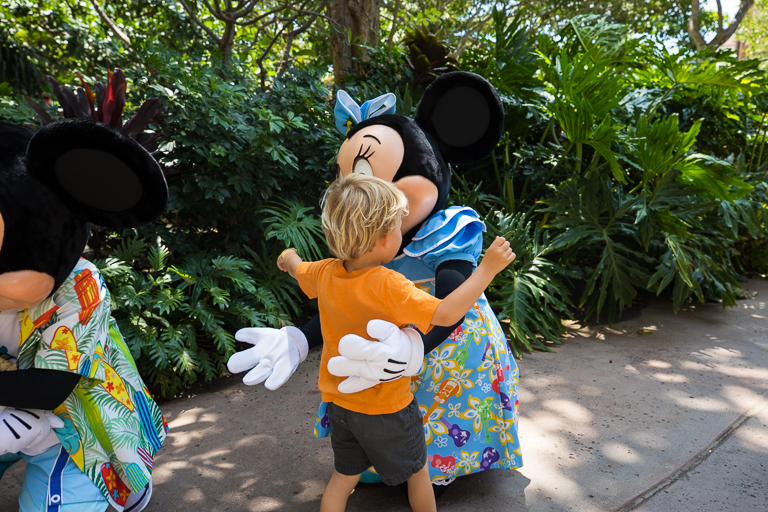 They might look like traditional decorations around the resort, but there's a bit of magic to them. 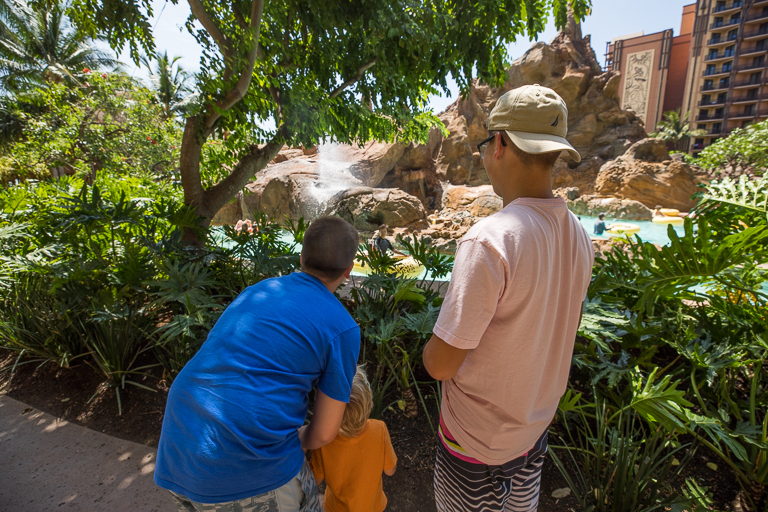 Like a the Koi pond where a mountain submerges and becomes the islands of Hawaii. Or turtles that pop up and swim in the same pond. And when you slow down to check out the details, you might even see a few more interesting things. 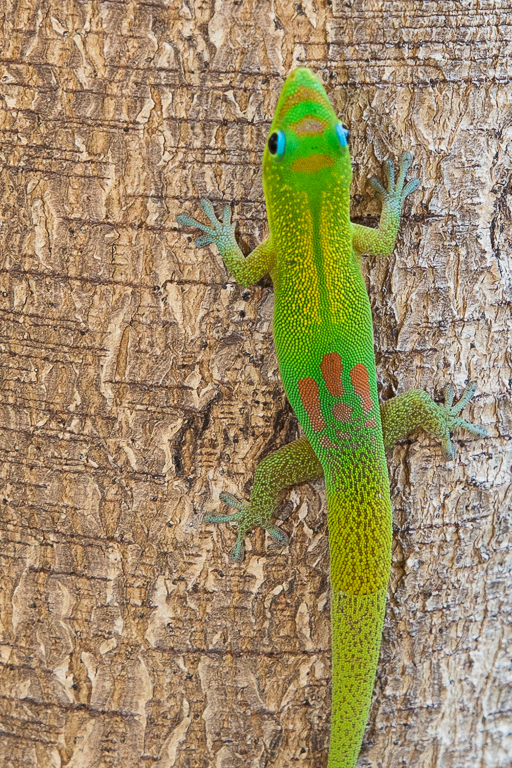 This was a really colorful lizard just hanging out on a nearby palm tree. 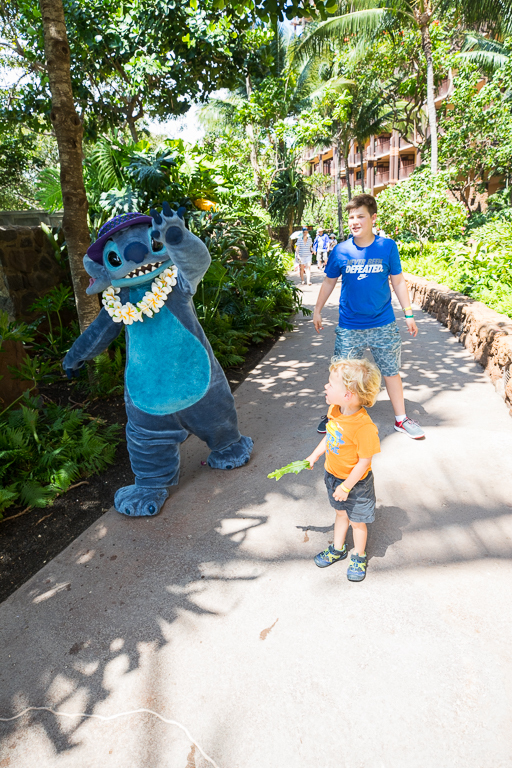 I love how the Disney characters are just randomly walking around the resort. It's like they live here and they're just going place to place along with everyone else. Ian's favorite things were when we could make things move or shoot water. Like this blowhole on a rock formation that looked like a whale. I was happy that you had the option to activate it a second time, because inevitably Ian would want to see something twice. 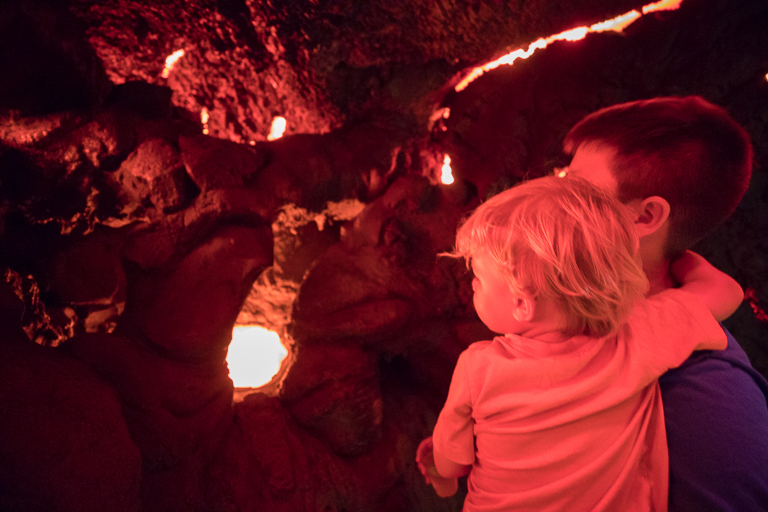 Underneath those waterslides we've been enjoying this morning is a cave with lava tubes. Ian was a little hesitant to go inside. Ian - I don't like lava. 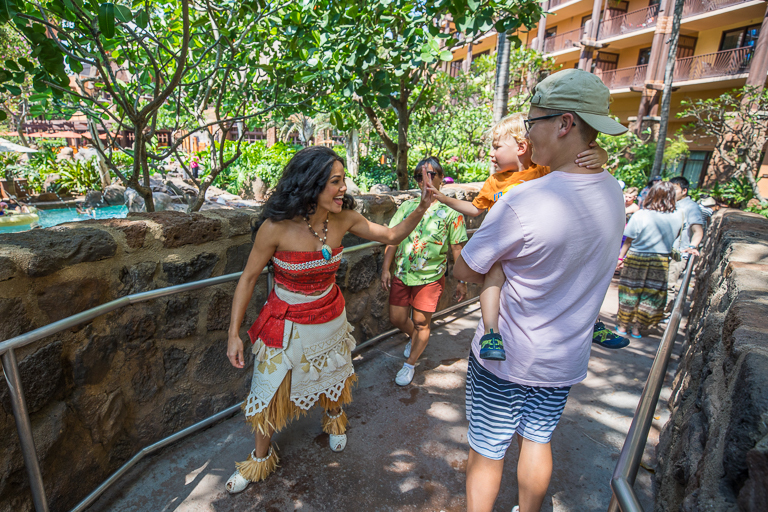 Oh you know, just Moana walking around. After she passed by, Ian said "She's very pretty." 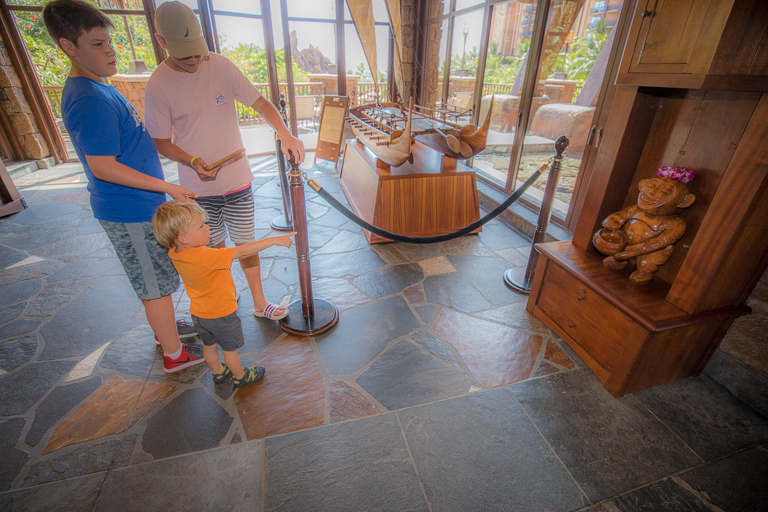 After exploring outside a bit, there's another Menehune Adventure inside. 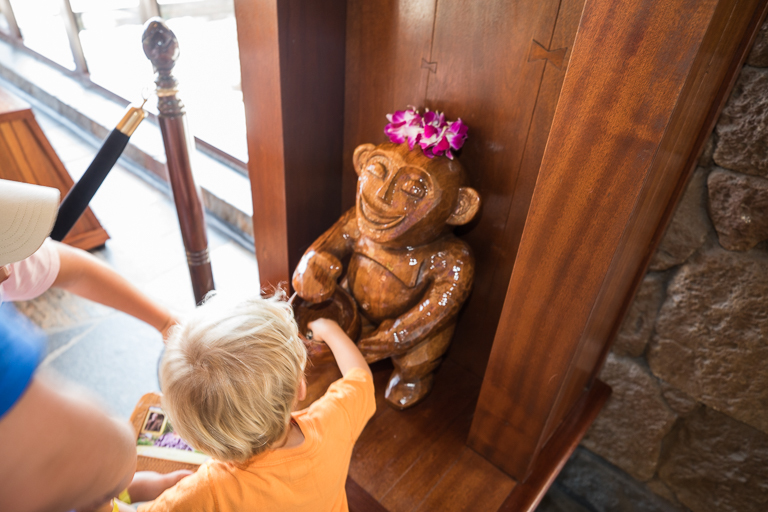 For one, you had to find this Menehune with a bowl. And out pops a nut of some kind. I also loved how the instructions we were given told us that we needed to "call Auntie". So Ian would usually yell "AUNTIE!" instead of pushing the button on the tablet. It's been a full day, but we're not through yet!